'STACCO' - Beautiful stainless steel etched permanently with a camouflage type pattern. With multi-directional textures in a high polish finish. Has an interesting fractured reflection of lighting. Similar to a pearloid effect, but in shiny and reflective metal. You would rather eat nails than go back to plastic. Fits neck humbucker with cover or uncovered. FITS - Any Fender HH Telecaster or Blacktop Tele. USA & MiM. Bridge Humbucker cut-out will Fit:Guard Bridge cut-out width is 94mm (3 3/4") for Standard humbucker surround mount ring (plastic or chrome surround ring), OR Gotoh Humbucker Chrome Tele Bridge Plate. 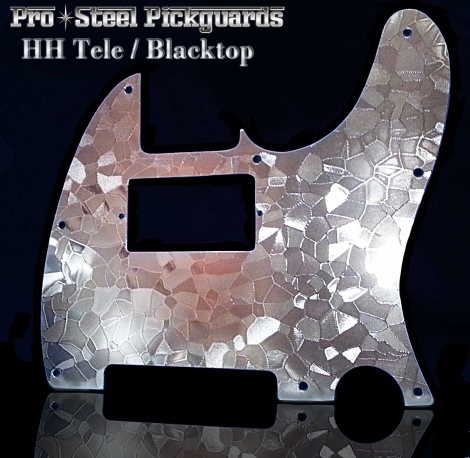 Squiers Tele's: Will fit recent Squier Telecasters, This guard has exactly the same external shape and screw holes as a Standard Fender Tele Guard, except cut for a bridge humbucker. See above for Fit.